The #Bayou #Classic #Brew #Thermometer is designed for serious home brewers. Designed to side mount a stockpot, it has a 3 inch face for easy to monitor brew stages. Encased in a stainless steel housing and tempered glass face. The Brew Thermometer also has ½ inch MNPT bulkhead fittings for easy attachment and water tight seal. I do Brew In A Bag (BIAB,) and installed this on the Bayou Classic 42 qt SS Pot along with the Heavy Duty 1/2″ Weldless Bulkhead w/ Stainless Steel Valve Heavy Duty 1/2″ Weldless Bulkhead w/ Stainless Steel Valve. It was an easy install using a step drill bit Neiko 10194A Titanium Step Drill Bit, and now I don’t think I would brew without it. Yes, you can use a remote digital thermometer, but once this is in the pot, no more worries or wires. It’s a breeze to calibrate, very accurate, and easy to read. I can get my water temp up to strike, dough-in, watch my infusion temperature, then heat to mash out without having to screw around with an external thermometer. The first time I used it, my bag got hung on the probe, but now, I just pull the bag from the far side of the pot, it goes right past it. If you BIAB, do yourself a favor and get this. 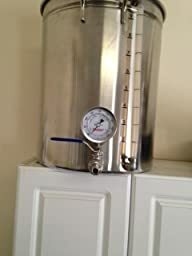 I am new to homebrewing and I have had a hard time getting a decent thermometer. This is my 3rd thermometer. I opened the box and was immediately impressed. The dial face is large and easy to read. Ambient temperature is spot on out of the box but allows you to adjust if necessary. Installation was easy and took a whole 10 minutes including walking to the garage and grabbing all the tools (I used a step drill bit). No leaks after boiling 3 gallons of water. Came with great instructions that are easy to read and hit all the important stuff. Note: the instructions say that this can not be used for a turkey fryer and you should avoid water contact with the dial face when hot to prevent the dial face from breaking. The only con I can think of is that I can no longer do an ice bath because the dial face may break. Can’t fault the product for problems with physics. Dial face is 3.25 inches in diameter. When installed the dial face sits 1 inch from the wall of the stockpot and temp probe enter the pot 2.5 inches. I only wish I would have saved time and just got this thermometer first and wouldn’t have needed to use the other 2 shoddy thermometers. I purchased this thermometer with high hopes of using it on my new mash tun build. In the box it looked like a solid product; I was even very impressed that the thermometer came with the necessary wrenches. Before using the thermometer on brew day I decided it would be a good idea to check to make sure it was reading proper temps. I work in a Quality Control lab and have access to calibrated temperature monitoring equipment. I was surprised to find the BC thermometer reading 20 – 30 degrees off. I used the set screw to make the appropriate adjustments and rechecked the thermometer. As it turns out the thermometer would not go above ~120ºF; it appeared to be stuck. Needless to say, I returned the thermometer for a refund and purchased a Blichmann thermometer. Maybe this BC 800-770 was just a defective unit; most others that have purchased the same thermometer seem to be pleased. My advice; check it before you use it. I can’t afford to ruin an all grain batch due to something as stupid as a faulty thermometer. As a side note: the Blichmann thermometer I purchased resulted in precise temperature readings right out of the box; no adjustments required.